We started in Temuco, then went to San Martin de Los Andes, Bariloche,Trevelin,Puyuhaipi,Coihaique,Perito Moreno, Gobernador Gregores, Rio Gallegos, El Calafate, Perito Moreno Glacier,El Chalten,Puerto Natales, Porvenir, (stop to visit to King pinguin colony), Ushuaia and Tierra del Fuego then Cerro Sombrero and back to Puerto Natales and Torres del Paine. 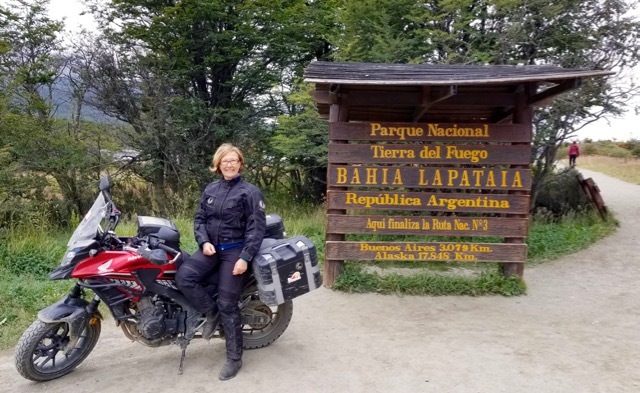 In addition to riding beautiful roads , seeing hundreds of guanacos, rheas ,flamingos and condors we have also met so many interesting people and learned so much! This is just a quick note from me, Hal will send you more feedback as well as some photos ( I'm sure you have seen that before ). I have made my favourite video clip while waiting for a herd of cows to pass by .